I just can't get over the flavor difference with SS vs titanium. 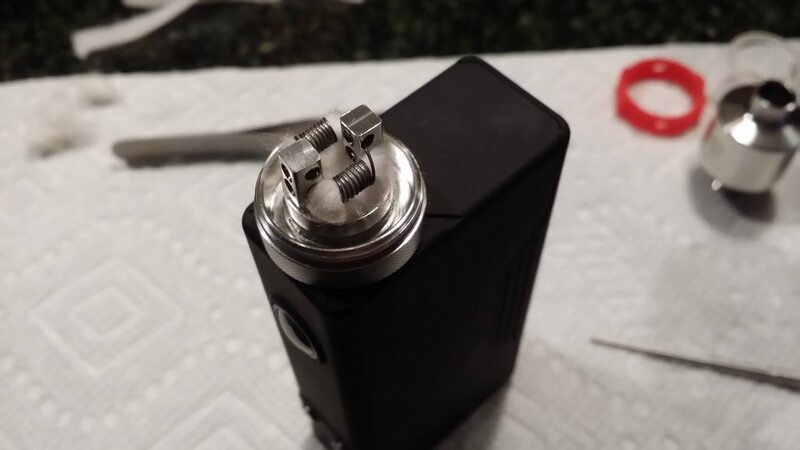 I just built a Ti1/KA1 clapton dual coil and it just tastes...funny. I only asked about SS430 because it's popular on that Unkamen site that everybody talks about. Also (and this I don't understand) on the site it lists its 430 as "nickel-free". Doesn't all SS have nickel in it?? It wouldn't be SS430 anymore without I would think. SS430 .. I listed the composition, it has less than 1% Nickel and has about 20% Chromium. As far as Titanium having a taste, absolutely not, it's a tasteless & odorless metal assuming you have cleaned Grade 1. Kanthal is especially on a Clapton is more than likely your culprit, I'd imagine your fingers had nice black streaks .. so I'd clean your coil .. soak in alcohol, clean with a brush, soak in water and then allow to dry. BTW I clean all of my wire with 91% Isopropyl alcohol before wrapping the coils, clean as stated above, and then low wattage pulse (dark orange; 10W single / 20W dual). The problem is in the processing especially polished wire gets machine oil and metal dust embedded into the wire. I suspect so, but haven't seen any science to back up the notion. I know that our taste receptors do pick up on iron flavor. Some people like the taste of iron in well water. It can give it a "sweet" taste. 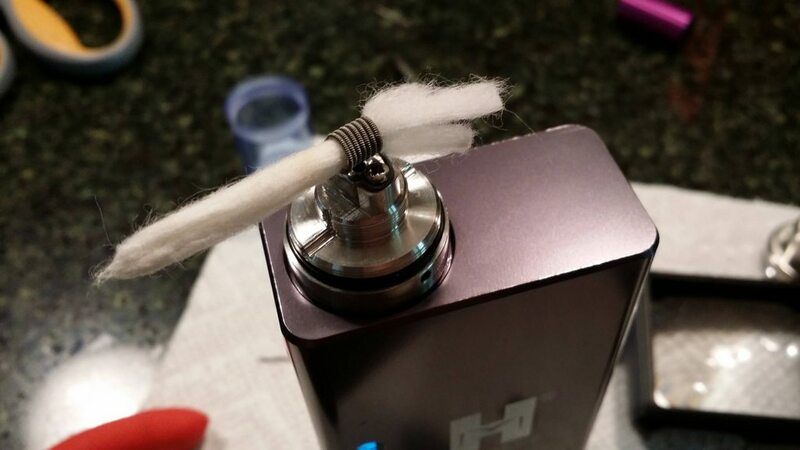 I have a hunch that may be why people like the "taste" of Kanthal. What I don't understand is how wire that is not supposed to be leaching, decomposing or otherwise vaporizing can impart taste. The only studies I've seen mentioned seemed to imply the amount of material given off is nearly nonexistent. Kanthal is the only wire I seem to detect any taste. Nickel is tasteless to me. I only have 70% alcohol and I do use it to clean the titanium and I tried to clean the kanthal but I ended up kinking it up by messing with it off the spool. When I wrap claptons I feed the wire directly off the spool. I use my fingers and thumb to hold the wrapping wire when I do it and everytime afterwards there are black streaks on my fingers. I figured I'd wiped off most of the dirt/oil with my fingers but I guess I didn't. When you say you low wattage pulse, do you do that with titanium? even spaced coils? Oh trust me I completely understand what you're saying about the Kanthal. What works for me is unspooling about 10' (3 M) and wipe from one end and in one direction then respool. Yep, I carefully dry burn my Titanium spaced coils, keep it 'dark orange' and clean with a soft brush (I use an old clean toothbrush). Done carefully it will perfectly clean the coiling and not form any TiO2 white deposits. Maybe I should be talking to you more about getting my titanium builds tasting and working great than messing with SS too much lol. Do you just use the Steam Engine Ti1 default? Where do you get your Ti wire? Do you do contact coils at all? Stainless Steel is a pain, I'm about done with it, and it's soooo much easier having 1 TC wire to deal with. Titan Wires http://titanwires.com/titanium-wire works great on all my Titanium Mods. LOL about the only quasi accurate CSV is their Titanium Grade 1 profile. I use Titan Wires and I'd recommend 24 (25 gauge actual after polishing), and yep I space them all. Probably not as much as you might think. Here's an example of one that was totally gunked up but I cleaned by 20W, dual, and rinsed under water with a toothbrush http://i.imgur.com/8WKpCNHh.jpg Stainless Steel is a pain, I'm about done with it, and it's soooo much easier having 1 TC wire to deal with. 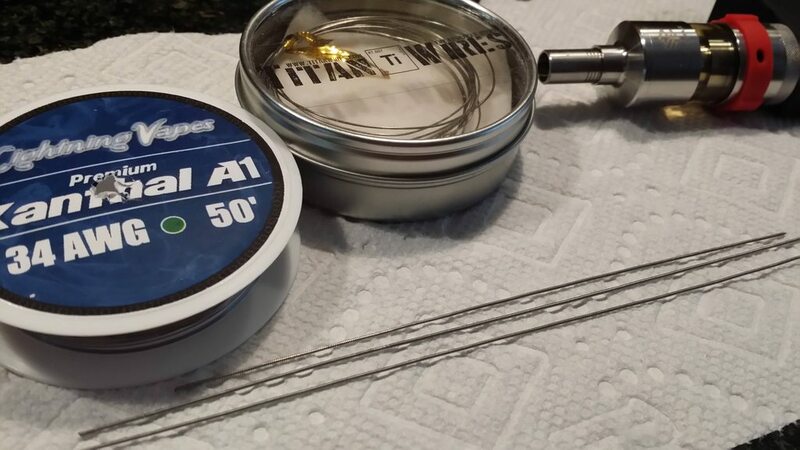 Titan Wires http://titanwires.com/titanium-wire works great on all my Titanium Mods. BTW my Ti builds look very different from yours. Not the wraps, mine are spaced just about the same, but the color. I don't dry-burn mine like yours, but mine is more of a lighter grey color. Like I mentioned previously I've only got experience with Lightning Vapes Ti 1. It comes light grey and then I wipe it down with that 70 Isopropyl Alcohol, wrap it, wick it, vape it. The only difference in the Titanium is rough vs polished. As I mentioned, I use 24 gauge Titanium. I think the gauge has more to do with the 'experience' .. I know I prefer 26 gauge Ni200 over 28 or 30, but I've done twisted and Clapton Ni200. I have some sweet Titanium / Kanthal Clapton's. Part of the flavor added notes is from mixing wire types in Twisted, Clapton's, etc avoiding 'monotone' temperatures. I'm not saying SS is garbage, I'm saying it's jumpy, difficult to properly TC, and because of the apparent alloy (foundry) differences one SS316L is not the same as another. In contrast Titanium has a steeper TCR and is both much easier to TC accurately and universally there's only one Titanium Grade 1 vs at least 4 alloy variants of SS316L not to mention multiple standardizations. China uses GB not SAE standards. The only difference in the Titanium is rough vs polished. As I mentioned, I use 24 gauge Titanium. I think the gauge has more to do with the 'experience' .. I know I prefer 26 gauge Ni200 over 28 or 30, but I've done twisted and Clapton Ni200. I have some sweet Titanium / Kanthal Clapton's. Part of the flavor added notes is from mixing wire types in Twisted, Clapton's, etc avoiding 'monotone' temperatures. I'm not saying SS is garbage, I'm saying it's jumpy, difficult to properly TC, and because of the apparent alloy (foundry) differences one SS316L is not the same as another. In contrast Titanium has a steeper TCR and is both much easier to TC accurately and universally there's only one Titanium Grade 1 vs at least 4 alloy variants of SS316L not to mention multiple standardizations. China uses GB not SAE standards. You said as you mentioned you use 24 gauge Titanium. I use 24 gauge Titanium as well. So is your titanium polished or rough? Is there any advantage in flavor for one vs. the other? I know this isn't the right thread for this but could you give me any tips on twisting/claptoning titanium builds to get best flavor and TC accuracy/stability? I have both the rough and polished, as far as taste IMHO they're the same. The polished loses 1 gauge, so 24 is actually 25; the polished is easier to clean. LMAO, I guess the unpolished holds flavor like a good old iron pan. It's 6 of 1, half a dozen to another .. neither is really better. The polished is typically to dirtiest from powdered Ti and machine oil. I clean them both. The most efficient Titanium / Kanthal Clapton's are 24 gauge Titanium with 34 gauge Kanthal http://i.imgur.com/hLJLgrEh.jpg but I've used 30 gauge which is also very nice, it depends upon the juice. Steam Engine allows for the mix and Clapton's, but you know me I edit my own based upon a Titanium Grade 1 CSV. Tomorrow I'll post it, CSV file, I'm on my phone. Edit .. I used some Amazon SS316L, UD SS316L, and then some FastTech SS316L which while off actually works better than UD's. I also purchased some cheap Titanium Grade 1 from FastTech which was dead on in TC not to mention a fraction of the price. SS3XXX wire, all of it should be dirt cheap!!! Awesome. Thanks for all the continued info. So the only small gauge Kanthal I have is 36 gauge. The problem that I have with ordering wire from FT (besides the obvious shipping time) is that you search one thing and get 20 results. How will I know exactly what the good one you got is? Or even if I order the same thing if I will get the same thing? I fear I'll get some crappy Chinese stuff passing off as 316L. You said yourself they use different standards. I love Amazon, maybe I'll look there. Sorry, I'm not trying to do a show and tell. If you have Ejuice that has different notes at lower temperatures that are different at higher then indeed Clapton's will bring both together for better or worse, generally better .. your battery / LiPo will remind you. I know UD is Chinese. I was hoping you would know a US source of good SS that was cheaper than vapordna. Do you think twisting Ti and Kanthal would still yield decent temp control accuracy/stability? What do you mean my lipo will remind me? Claptons would take more battery life I assume?